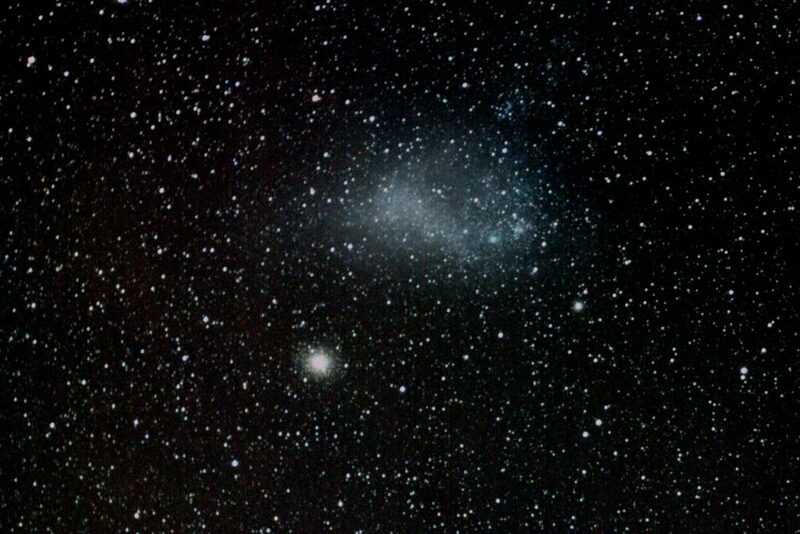 A few nights ago, I captured this image of the Small Magellanic Cloud and the nearby globular cluster 47 Tuc. It had been a while since I’d last taken the camera outside, and I wanted to grab something relatively simple while the weather was still clear. So I decided to have another go at capturing a long exposure wide-field image. 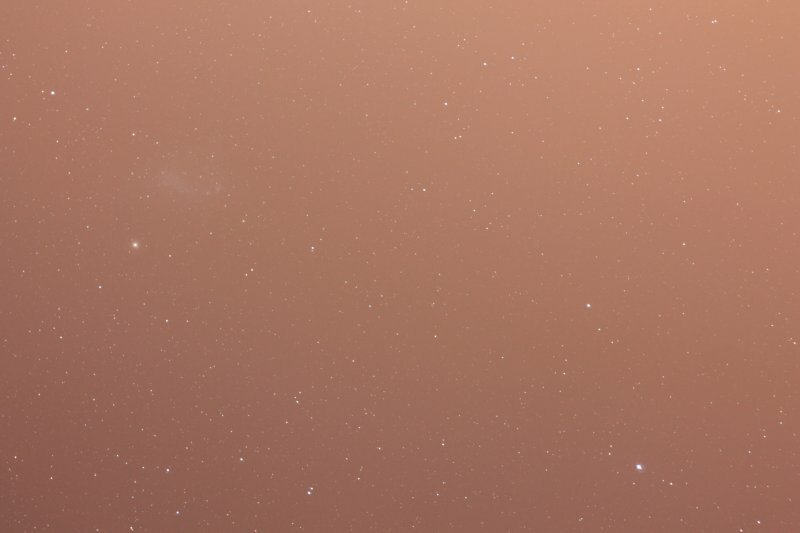 Previous images of the Milky Way in Sagittarius, and the region around Crux and Carina, had been disappointing because of bad colour and poor contrast, but I’d recently discovered an article explaining at a technical level what the ISO setting in DSLR cameras actually does, which gave me an idea of what I’d been doing wrong. If you’d asked me before what the ISO setting meant, I’d have told you that it affects the camera sensor’s sensitivity to light. A higher setting is more sensitive, but this increased sensitivity also creates more noise. However, it turns out that the sensitivity is a fixed characteristic determined by the manufacturing process. The ISO setting changes the amplification of the signal emitted by each pixel, after the photons have already been captured. This boosts signal, of course, but it also boosts noise. In regions where there is little or no signal (that is, those black regions of empty space that dominate most astrophotos), that boosted noise really stands out. Note that there isn’t any more noise in your data than there was before, it just appears worse because it’s been amplified. It’s like turning up the volume on an AM radio – the hiss and static in the background gets amplified, but it’s still just the same noise that the radio was receiving all along. But there is a more subtle effect to raising the ISO rating: boosting those signals does not increase the maximum value the camera can record. You make the weak signals stronger, but the strong signals saturate earlier. You’re compressing your brightness levels, in other words. Where my 12 bit camera starts with 4096 possible brightness values for each pixel, at a high ISO level it might now only have an effective range of 512 values. The existing range of values has to be downsampled to fit into the new range, with the result that you lose contrast. Features in the sky that are only subtly different from each other are now recorded as being the same, and so fine details get lost. So, when shooting under extreme low-light conditions (which is practically the definition of astrophotography), use lower ISO settings and brighten the image by increasing exposure time and aperture. I started planing my shot a day before. I picked the SMC as my target, and had settled on ISO400 as the best compromise between gain and contrast (refer to the link in the 1st paragraph for more about the process I used to choose that setting), and arbitrarily judged 120 seconds as a reasonable exposure time. Also, since 47 Tuc is right up against the SMC, I wanted to include it in the picture. 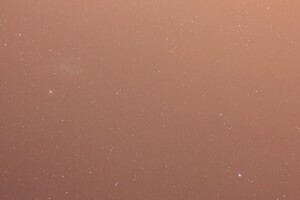 I then spent a bit of time in Stellarium, using the Ocular plugin to compose the shot on the camera sensor. Come evening, it was a simple matter of setting up the telescope and screwing the camera down onto the piggyback mount. Since the telescope itself was not being used at all, I did not fit any eyepieces, and left the lenscap on. All that mattered was the clock drive and the equatorial mount, allowing the camera to track the apparent motion of the stars. Polar alignment wasn’t perfect – there was a shift of about 20 arcseconds between the first and last frame – but it was good enough to not show any obvious streaking in any of the individual frames. To focus, I roughly centered the view on Achernar, tethered the camera to my laptop and used LiveView at maximum zoom to find the sharpest focus. And then I acquired the target, set the EOS Utility to capture 20 frames of 120 seconds each, and left it to run while I went inside for a hot mug of tea. After about 45 minutes, I went back outside, put the lens cap on and captured another five frames, identical to the previous set, for use as dark frames. Once all that was done, I tore the rig down, packed everything away, and began processing. There was an abortive attempt at capturing flat field frames (at the optical settings I’d used, I needed a fast shutter to get captures of the right brightness, but this meant that I captured the raster of the LCD screen I normally use when capturing flats at night). The results were unusable, so I just created a new image, set all pixels to a value of 5000 and saved it as a fake Master Flat. I then went ahead with my usual processing procedure: import all raw images and convert to Iris’s internal format, combine the darks to make a master dark, create a map of hot pixels, pre-process all the light frames using my master Offset frame that I created several years back, my new master Dark, and the fake master Flat. Then convert the resulting images to RGB (“Develop” them), register them, and experiment with different stacking algorithms till finding the one that reveals the most detail while generating the least noise. Then remove the background gradient, set black levels and white balance, set the brightness distribution from linear to “Dynamic Stretching”, and save! Incidentally, if you’re curious to see what the raw data looked like, to see what all this processing achieves, here’s a single frame that I captured with the camera in “Medium JPG” mode, before switching to “RAW” and beginning the imaging run. The most obvious difference is the light pollution – it’s nothing as obvious as this to the naked eye, but a two minure exposure is more than enough to soak it all up and reveal the colour of distance street lights. Oh, and if you’re wondering why the sky glow is brighter at the top of the image than at the bottom, it’s because the camera was upside down at the time thanks to the peculiarities of aiming a telescope on an equatorial fork mount, and I haven’t bothered rotating the image to line it up with the actual appearance from my latitude at that time of night.